The recent history of drug patents in India has had a significant impact on world health. 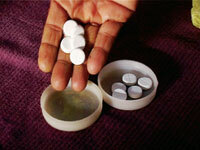 For over fifteen years, India has been largely self-sufficient as a manufacturer of generic pharmaceuticals. Poor families benefited from India's historic 1970 Drug Patent Law, which granted patents on the process rather than the product. Low costs means it's also been a major supplier in producing affordable drugs for the rest of the developing world, especially Africa and Asia. Now, India's $4.5 billion pharmaceutical industry is at a crossroads following a new law introduced there in January 2005. TRIPS (Trade-Related aspects of Intellectual Property Rights) is an agreement drawn up by the World Trade Organization between 1986 and 1994 to ensure intellectual property rights are respected within international trade. The government says that despite the new law, they are committed to supplying drugs at an affordable price. But those actually working in the health system have doubts.